The IKEA in Delft, here in the Netherlands, has recently expanded their store, doubling its size and destroying an important nesting habitat for bats. To provide shelter for the displaced bats, the city of Delft is funding the construction of a special bat-cave behind the IKEA store. The design was copied from a similar project in a park in Rotterdam; the bunker is made up of concrete wells connected with underground sewer pipes, covered with isolation for noise reduction. Recycled and discarded materials will be used to build the new bat-cave, which will have a price tag of around € 50,000. 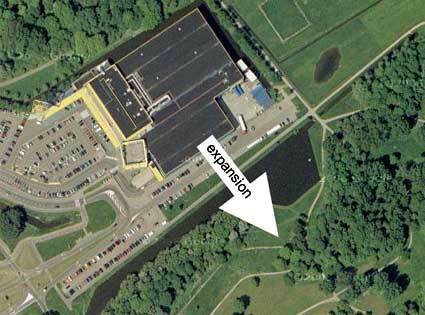 Here’s an aerial photo (source: Google Maps) of the IKEA in Delft how it was last year. The building has now expanded and doubled its size into the green area. This entry was posted on Friday, October 6th, 2006 at 10:56 am CET and is filed under Life in Holland, Nature	with tags . You can follow any responses to this entry through the RSS 2.0 feed. You can leave a response, or trackback from your own site.